It is London Fashion Week, and David Grant is on the catwalk in Old Spitalfields Market to meet models with a difference. TV reverend Kate Bottley tries out couture clergy wear. Browse content similar to 18/09/2016. Check below for episodes and series from the same categories and more! one that's celebrating models of all shapes and sizes. not Nicki, the disabled person. has had the best seat in the house at some of the top catwalk shows. God was the first fashion designer. I think he'd want clothes which were well made. will be trying out some clergy couture. and I think I do a better job. with performances from Only Men Aloud and Jermain Jackman. from St Mary-le-Tower Church in Ipswich. fringe events are popping up all over the capital. as diverse as the location. who noticed a lack of diversity in the modelling industry. People come in all shapes and sizes, so why shouldn't models? and find clothes that should sit how they should. for every occasion, including worship. you'd dress appropriately, wouldn't you? when you're going to see God, so it does matter to Christians. because I haven't actually done a live catwalk show. I love fashion. I'm very proud of that. I've had some great moments with fashion. Not that one. For 30 years, Simon Ward has been part of the British Fashion Council. he's written about the relationship between fashion and faith. and then to generally have a gossip about the whole day's events. It's an odd combination, isn't it? Fashion and faith? Do you think that God is interested in fashion? Well, I don't think it's odd at all. God didn't start with a business plan. He started with an act of creativity. so let's not talk about why do we always have change. when Adam and Eve got it wrong. so he was the first fashion designer. And all the way through the Bible, fashion appears. he's wearing a long robe with a golden sash around it. "how might he run things?" and thrown out of the church for that. which were made by people who were properly paid. you know, had nothing to live off. be worried about the way it looks externally. "Where did this come from, who made my clothes and how? who love fashion and are influenced by what they see. can be influenced by the fashion industry? It's the creators, really, at the designer end of the industry. They sail pretty close to the wind. they work with particularly skinny models. "by just one or two, all this issue would probably go away." recognise the influence they have, particularly on young girls. so the two really have to sit together. it's not just top models that like to cut a dash. as TV reverend Kate Bottley finds out. to design day-to-day wear for female clergy. and it's going from strength to strength. So, what's going on here? Well, we're having a photoshoot. who are getting the next collection onto our website. Tell me about...where did the idea for the company come from? in the way of clothes that I felt comfortable with and wanted to wear. There were a lot of adapted male shirts. That colour is amazing on you. I like it. It's cornflower. if you're doing a wedding, you can go on to the reception. You look fabulous in it. I love it. Thank you. because I'm so desperate to wear something that I actually like. What would you say to people who say this is disrespectful to the cloth? You know, the collar is a wonderful thing. Really opens doors. Really opens conversations. or wear things we would like to wear as well? I think I want to go look at some clothes. Can we go shopping? Yeah! I begin with trying on some colour. It looks good on all shapes, sizes and ages. Now, I'm not quite convinced by this one. Yeah. and people knew straight away what that colour meant. have you had any complaints? and so we need to be reminded that we are sinful. That's quite a bold choice, isn't it?! It is, but Christmas is coming! Oh, you look fabulous. Do I? You do. Bless you. Let's have a look. It's actually a clergy outfit I might want to wear. Yes. Like, I could wear this doing a funeral. For the wake afterwards, I could wear this. I could wear it to a wedding reception. It would do any occasion. But it's lovely. Very versatile. Really nice. It's very useful. This is the one. That is the one? Yeah, this is it. Sandra, clothes aren't the be-all and end-all of everything, are they? No. We're doing a great job for Jesus, that's what we're doing. That's who we love, and the clothes are just a part of that. "clothe us who love him?" that we exude that beauty that's beyond clothes. It's actually an inner beauty. for the sale of Christmas cards. to design a Christmas card, with proceeds going to Children in Need. Now it's time to get them ready for sale. Let me introduce you to our winners. We've got Orla, Denise and John. Exactly. They're all excited, so over to you, Spence. OK, this is the beginning where we just go through to the graphics. have been scanned into the computer software. we lay them all out on a sheet into position. seeing yours on the screen. There you go. I thought, "What does Christmas mean? What was the first thing they saw at Bethlehem? It was a star. Fantastic. Simple is best. What were you thinking when you came up with your design? and it tells the story of Christmas for me. And it's such a lovely melody, and I felt I just had to do it. And we've got a completely different scene from you, Denise, haven't we? It was obvious what I had to do. Yeah. So I thought of the mother and child. Mm-hm. And then the importance of the star. as the future of what was in store. I love the power of that colour coming through that. That's the meaning of Christianity, isn't it? Yeah. Beginning and the end. Yeah. The beginning and the end. which outline which colour to print where. We probably print about 70,000 to 80,000 cards an hour. Looks like a messy business. Yeah. A little bit. Yeah. ..and then out come the cards in their thousands at the other end. Wow. Looks good. It's beautiful. And now you can see them all next to each other as well. What do you think about the selection? It's got a real religious, beautiful theme to it. Yeah. But look at those two children saying their prayers. It's so sweet, isn't it? Beautiful. There's something for everyone there. They're beautiful. I like the snowman, his nose. He's got a nice... Yeah. These came out really well. And these two penguins. The mistletoe will bring them together. Yeah. and ready to be revealed to our winners. The fruit of your labour. I have the finished cuts. and it's such a good way of raising funds for Children in Need. someone who wants to say thank you. He has a present for each of you. and BBC Children in Need. Thank you very much. all in aid of Children in Need, go to our website. we welcome you to tonight's show by Models of Diversity. is that the models represent a different range of people. because we don't all come in one shape and size. as well that we've got, because we've got a lot of supporters. and we all love fashion. to want to be in fashion and to be a stylist. Did you pick them out yourself? for wanting to be here today. before a car accident in 2011 left her paralysed. How did your attitude to fashion change after the accident? I never realised how difficult fashion is in a wheelchair. changing rooms aren't accessible, clothes are too high. Clothes alone have to be adjusted myself back at home. is a mannequin on a wheelchair. Yeah. That shows they've included me. It's been a long journey back to health for Nicki. she was close to death and spent two years in hospital. But I knew I was a mother, I needed to fight back. I had to adjust very quickly to being a woman in a wheelchair. And even now, it's hard. What was it that restored your relationship with God? and to this day, I've still got that prayer with me. and God will never give up on me, just like my daughter never will. It's been a brilliant experience for those watching and modelling. was what I really needed to hear. 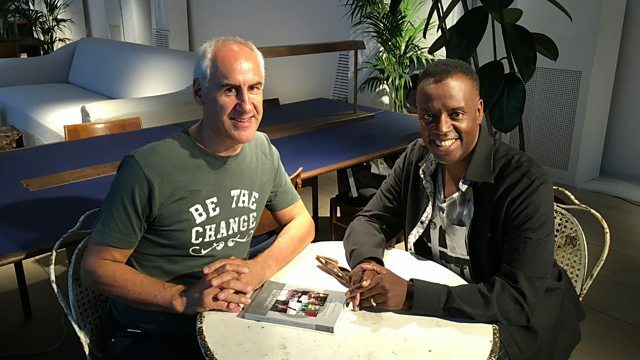 It is London Fashion Week, and David Grant is on the catwalk in Old Spitalfields Market to meet models with a difference. TV reverend Kate Bottley tries out some couture clergy wear. Music: Let Us With Gladsome Mind from St Mary-le-Tower, Ipswich Still Haven't Found from St German's Church, Cardiff Take My Life from Dunblane Cathedral Be Thou My Vision from St Alban's Church, Bristol Go Tell It On The Mountain from the Hackney Empire, London I Look To You from St Germain's Church, Birmingham For The Beauty Of The Earth from the Salvation Army, Sale.